The world of telematics is exploding. As new and improved methods of transferring information off of rolling stock improve and become more affordable, miners are finding all different kinds of applications that improve productivity, simplify maintenance and enhance safety. There are several available tools currently being offered in each category. The air intake sensor on board a Komatsu 830 truck. Data is sent through an IronSyte communications unit to the IronSyte server for processing. One common area is found in haul road layout. While larger open-pit operations generally have fixed haul road locations and are designed and maintained to eliminate bottlenecks, the same cannot be said at smaller operations where haul roads change frequently and are subject to a myriad of road building variables such as availability of suitable material, weather conditions, geology and optimum pit layout. All of these factors can contribute to less-than-optimum haul road conditions that can significantly reduce haul road speeds and fleet productivity. Unless a supervisor is always out in the field performing time studies and checking conditions, these unfavorable conditions can go unattended for extended periods of time. By monitoring fleet activity with a fleet monitoring program, metrics such as haul speeds, cycle times, haul distances, and load counts can all be accessed and analyzed from a computer with reports and alerts generated for any exception that a supervisor wants considered. 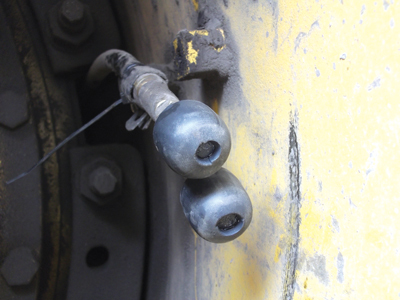 A wheel sensor mounted on a Komatsu 830 haul truck. This sensor monitors changes in temperature and vibration in order to determine wheel bearing health, with results sent to an IronSyte server. Another hidden area of inefficiency, which is seen frequently at many operations, is called Fleet Post Start/Pre Stop Time, or FPST. This is the time from shift start until when the operator actually takes his unit into production at the start of the shift and the time between when the operator parks at the end of the shift. 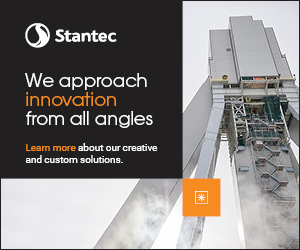 At most operations, this is a concern for production foremen and superintendents. In many cases, because of all of the inspection duties required by foremen and superintendents, the actual managing of FPST is oftentimes overlooked as a management priority. By using a fleet monitoring system, this FPST can be tracked and reported. A report showing FPST performance can be generated for each shift and lost time can be analyzed and eliminated. In many cases, just the awareness of this metric and the fact that it is being tracked can improve performance significantly. Over a 10-hour shift, or 600 minutes, if an operation can improve FPST by 12 minutes (6 minutes getting off of the line and 6 minutes at the end of the shift), that results in a 2% increase in productive efficiency. The air intake sensor, shown here, detects sudden rises in air pressure on the intake line to alert the maintenance department that there is a clogged air filter. 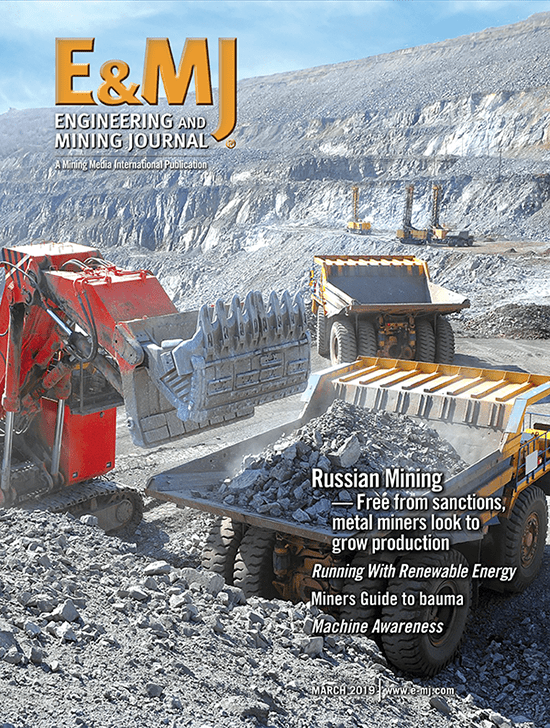 While newer surface mining equipment often offers telematics packages that enable users to monitor a vast array of on-board diagnostics, many of the older units in operation do not. 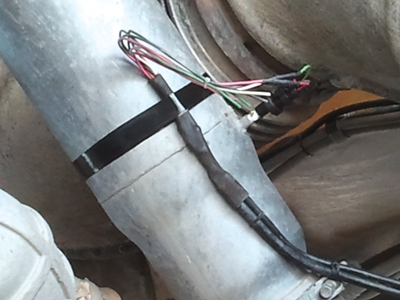 By tapping in to the on-board diagnostics of older units and sending them back to an office using the preferred method of telematics, the maintenance department can be armed with much more information that can be used to make intelligent decisions that enhance repair before failure, safely extend periods between preventive maintenance, and reduce unplanned downtime and repair costs. One major best practice that has been growing in popularity is remote tire pressure monitoring. 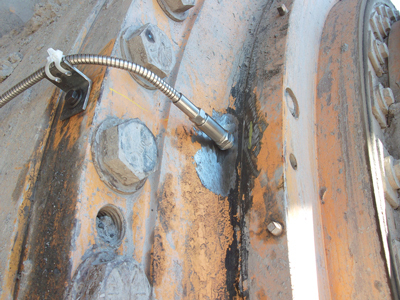 By using various tire pressure sensors currently available on the market today, coupled with a telematics solution, surface miners have the capability of remotely determining working tire pressures and temperatures in near real time. • By monitoring working tire pressures and temperatures, catastrophic sudden tire failures caused by severe under-inflation or increased temperature can be eliminated. • Alerts can be generated any time a tire is operating outside of set pressure or temperature specifications, and these can be addressed by the tire man accordingly. • Maintaining optimum pressures extends tire life. Some tire manufacturers claim that every percent that a tire is over- or under-inflated from the optimum level results in an equal reduction in tire life. 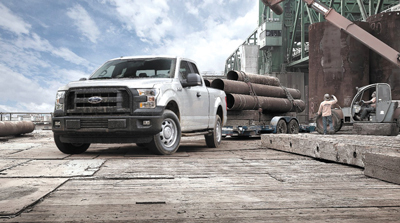 On a fleet of 20 trucks running $50,000 tires, a 10% cost savings can be significant. One user in the Central Appalachian coalfields recently reported extending tire life on their fleet of Komatsu 830 trucks from 5,500 to 8,000 hours by using a tire pressure monitoring system to help them manage tire pressures. 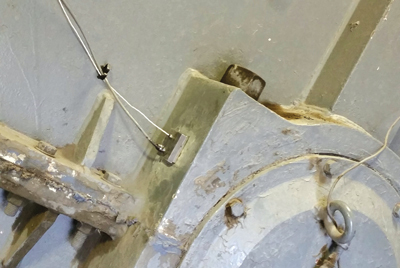 A temperature and vibration sensor mounted on this bearing on a large rope shovel gathers critical data for interested users. Remote monitoring of the tire pressure reduces the required maintenance hours needed to manually check every tire in a fleet. This frees up mechanics or tire personnel to attend to “real” issues in a more timely and effective manner. Using a monitoring system to extend fleet tire life also has the added benefit of reducing capital invested in tire inventory. A fleet of 20 trucks running on $300,000 worth of tires results in $6 million of rolling rubber. Depending on a mine’s philosophy of inventory to keep the fleet running, the capital savings resulting from increased life and resulting in reduced inventory can be significant. Employing a monitoring system to maintain optimum tire pressure also reduces fleet fuel consumption. Monitoring tire pressures results in reducing unplanned downtime because tire issues are managed proactively rather than waiting for low pressures or high temperatures to force the downing of a unit. By maintaining tire pressures through monitoring, mine operators also enhance safety by increasing handling and braking of the haul units. Also, a number of different sensors are available on the market today that, again, when coupled with a preferred telematics option, allow for problem areas to be monitored and alerts sent if issues arise for things like air filter restrictions, oil condition sensing, wheel motor bearing vibrations or any number of other areas. The bearing temperature display on a large rope shovel allows an operator and the maintenance office to maintain awareness of bearing temperatures and alerts. 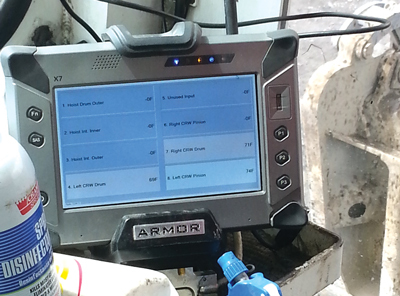 In similar fashion to production and maintenance, various functions can be monitored on other areas of mobile equipment that can help to enhance the safety of the workforce at a surface operation. For instance, management can be notified if seat belt usage is in compliance while the unit is in production. If a unit rolls over, an emergency notification can be sent over the telematics platform to alert others and initiate a response and speed restrictions can be monitored and alerts generated for any infractions. These are just a few of the various functions that a fleet monitoring system can address in terms of enhancing safety for the mine operator. Tom Lampert is president of IronSyte Monitors, a company based in Pittsburgh, Pennsylvania, USA, that provides real-time monitoring services, instant alerts and reporting for earthmoving equipment.